Happenings: Fiona Staples and Andrew Foley launch DONE TO DEATH in Saskatoon tonight! Are you in Saskatoon? Craving some culture? 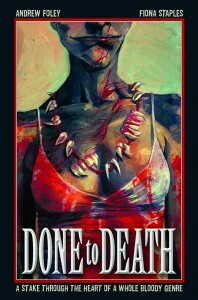 Then head over to Amazing Stories Comics and join them for the Saskatoon launch party for DONE TO DEATH, a collaboration between Shuster Winner Fiona Staples and Andrew Foley, writer of COWBOYS & ALIENS! Fiona & Andrew will be signing copies! The event runs from 3-8 PM, and there’s an after party at Earls in the Rhino Room. Get you some! Fed up with receiving poorly written Twilight knockoffs, editor Shannon Wade did what any reasonable person would: she started killing the worst of the would-be authors sending them to her. Meanwhile, Andy, a stuttering, overweight vampire has targeted those who portray vampires in a light he deems unrealistic. Not exactly novel but terribly graphic, Done To Death follows Andy and Shannon’s paths towards a collision as darkly funny as it is ridiculously violent. This entry was posted in 2011 Releases, General Announcements, Happenings, Retailers by Andrew Walsh. Bookmark the permalink.